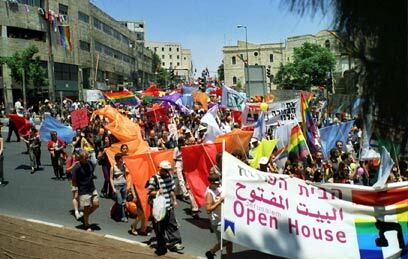 Haredis take on WorldPride Parade: In protest of the 2006 WorldPride Parade, scheduled to take place in Jerusalem on August 10, hundreds of letters, advocating "death to Sodomites", were distributed to Jerusalem mailboxes on Tuesday morning. They promised NIS 20,000 to "anyone who brings about the death of one of the residents of Sodom and Gomorrah." The letter appeals to residents of the capital: "don't let them teach our children their impure ways." The anonymous letter also suggests using Molotov cocktails against marchers and adds instructions as to how to make them at home. The explosives are nicknamed "Shliesel Special", in honor of the Haredi protester who disrupted the Jerusalem Pride Parade last year by stabbing three marchers. The letter goes on to say, "During this parade, 300,000 corrupt animals are anticipated to march through the holy city of Jerusalem, waiting avidly for the chance to put themselves on display before our children and our sacred Torah. They will try as hard as they can to defile as many of our innocent children as they can." Members of the 'Red Hand for Redemption', who penned the letters, are unknown among the Haredim. Sources in the community told ynet that, to them, the letters seem like more a teenager's "practical joke" and said that "this is not the way of a community in the midst of a struggle." Jerusalem city councilman Sa'ar Netanel (Meretz) said in response that "this is a worrying escalation and a license to kill. It needs to shock and appall everyone and cause everyone to ask himself whether he wants Jerusalem to take on the image of extremists who forget all humanity or to take on the image of marchers who only as for patience, tolerance and pluralism." While denying responsibility for the violent letters, the Haredi community has distributed formal flyers in protest of the parade. The flyers contain implicit criticism of Shas as "representatives of religious parties trying to appease the international storm regarding this issue by negotiating to change the location of this defilement to Tel Aviv." 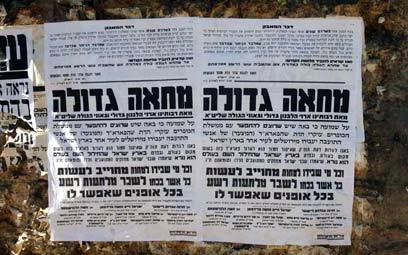 The flyers, hung all over the neighborhood, appeal to the Haredi community as well: "anyone with the ability to do so has the duty to do everything he can to smash the jaws of evil in any way that he can." The document was signed by the leading rabbis of the Haredi community. Monday night, Jerusalem city councilman Sa'ar Netanel (Meretz), arrived at Meah Sha'arim and was chased out by furious residents. Netanel, the owner of a gay bar who is working with the Open House to organize the World Pride events, explains that he arrived in the neighborhood with a camera crew "to document the anti-Parade flyers and the whole phenomenon in general." Netanel told ynet that he didn't think his arrival in the neighborhood would constitute a particular problem "because we arrived on a weekday, not during the Sabbath, so as not to create a needless uproar. It never occurred to us that anything would happen but, much to our surprise, within two minutes, Hassidic residents crowded around us and threatened us that, if we did not leave immediately, they would chase us out with stones. Since neither the crew nor I wanted to cause a commotion, we got into the car in order to leave." He continues, "Despite this, some of the Haredim tried to prevent our exit. In the end, we got out safely." Aaron (fictional name), a resident of Meah Sha'arim tells that one of the residents recognized Netanel and immediately chased him out with shouts of 'Gevald'. "Meah Sha'arim is a lion's den," he warns. "People like him are forbidden to enter here. Why does he have to come specifically and on purpose to Meah Sha'arim?" Netanel describes the experience as frightening and adds, "If I would have imagined that it might end this way, I never would have gone there at all." But he wonders: "How is it that a person is forbidden to film in the street? My conclusion is that they have no god." The Meah Sha'arim neighborhood is considered the sanctuary of the Haredi community, many of whom are deeply opposed even to the existence of the state of Israel out of the belief that Zionism, because of its merging of Judaism and secularism, is heresy. In recent weeks, with August looming ever closer and the WorldPride events, including the pride parade, still scheduled to take place in Jerusalem as planned, rabbis declared a total war against the events out of their belief that homosexuality is an abomination. Haredi rabbis have stated repeatedly that they will prevent the Pride Parade at any price and have crossed internal party lines to join forces to prevent the march. Former Chief Rabbi Ovadia Yossef himself, in a sermon last Saturday in Jerusalem, said that "on the day they announce (the parade), we'll have a demonstration, we'll protest for the honor of Torah and the sanctity of Israel." The Rabbi explained that the Torah commands the nation of Israel to behave modestly, and not as in "the repugnant land of Egypt" where "woman married woman and man married man". He referred to homosexuals as "evil abominations." See all talkbacks "Prize offerred to whoever kills gay person "